Dr Edward Denison (Bartlett School of Architecture) has won the RIBA President’s Medal for Research 2016 for the best research project, selected from the RIBA President’s Awards for Research. Winners of the 2016 RIBA President's Medals and the President's Awards for Research were announced at the Royal Institute of British Architects (RIBA) in central London last week. The coveted RIBA President's Medal for Research was presented to Dr Edward Denison, Medhanie Teklemariam and Dawit Abraha for their project, 'Africa’s Modernist City: UNESCO World Heritage Nomination'. 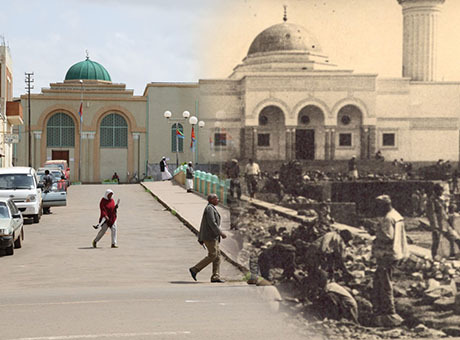 The research, supported by the Asmara Heritage Project Team, combines past and present photographs to convey the life of a building in Eritrea's capital city over time. Denison's collaborative research project was selected from winners of the 2016 RIBA President's Awards for Research, in four categories: Cities and Community, Design and Technical, History and Theory, and the annual theme Learning from Projects. The Presidents Research Award in Learning from Projects was presented to Bartlett Tutor David Roberts for his work, 'Make Public: Performing Public Housing in Ernö Goldfinger’s Balfron Tower'. Roberts’ entry was based on his PhD thesis looking at the history and future of east London housing estates undergoing regeneration. The ceremony also announced Bartlett student Robin Farmer’s Dissertation Medal commendation for, 'A Flâneur’s Guide to Boystown: Performativity, Pride and Place'. Commenting on the awards, Dr Kat Martindale, RIBA Head of Research and Innovation, said: "Particular congratulations go to the winners of the President’s Medal for Research, a collaboration between the Bartlett School of Architecture and Asmara Heritage Project, whose work has the potential to transform how Eritrea and African architecture are viewed. "We were thrilled to receive so many submissions from all over the world, making this year the most competitive to date and highlighting the strength of the winning work."